Abby the Librarian: Primates and Nonfiction Monday! Happy Nonfiction Monday, everyone! Today I've got a review of the awesome nonfiction graphic novel, Primates, and I'm really excited to hear about the nonfiction you've been reading lately. Please leave a link to your post in the comments and I will add to the roundup throughout the day! 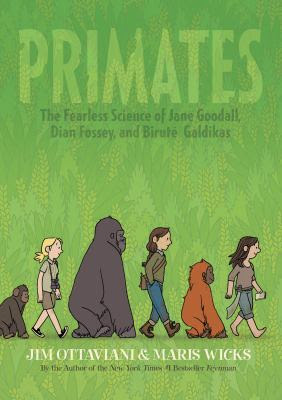 Primates: The Fearless Science of Jane Goodall, Dian Fossey, and Birute Galdikas by Jim Ottaviani & Maris Wicks. Grades 7 and up. First Second, June 2013. 133 pages. Review copy provided by my local library. Jane Goodall. Dian Fossey. Birute Galdikas. Three women who revolutionized the field of primate anthropology, bringing chimps, gorillas, and orangutans (respectively) into the public eye and redefining what it means to be human. These are three women who aren't afraid to get dirty, who aren't afraid to sleep outside, who aren't afraid to infiltrate a man's field. Primates presents the lives of these incredible women, focusing first on Jane Goodall, then on Dian Fossey, then on Birute Galdikas. The stories flow, connected by each woman's relationship with anthropologist Louis Leakey, who thought women made better primate researchers because they are "more patient and give more of themselves". He was right that each of these women made excellent scientists. Jane Goodall discovered that chimpanzees use tools in the wild. Dian Fossey brought gorillas into the public eye and fought against poachers. Birute Galdikas studied the elusive orangutan and helped to improve rainforest conservation. Full color illustrations complement the frank text, bringing each woman to life by showing important scenes in her life. The true stories are told with a dose of humor, making these scientists instantly accessible to the reader. Back matter includes an afterward where Jim Ottaviani notes where he took poetic license for the story. The book also includes a bibliography, suggestions for further reading, and a photo of the three women together. This would be a great book to hand to budding scientists or to read as part of ecological study or Women's History Month. The comic format will definitely up its appeal to some readers and I'd recommend it to fans of graphic nonfiction, as well. Readers interested in these particular scientists may enjoy biographies about each woman. There are many books by and about Jane Goodall and Dian Fossey and there's even a book about all three women: Walking with the Great Apes by Sy Montgomery. Another intertwining collective biography of awesome women is Borrowed Names: Poems About Laura Ingalls Wilder, Madame C.J. Walker, Marie Curie and Their Daughters by Jeannine Atkins. And if your reader is looking for additional graphic biographies and memoirs, try Relish: My Life in the Kitchen by Lucy Knisley or Persepolis by Marjane Satrapi. Primates is on shelves now! Myra of Gathering Books shares a post about Drawing from the City by V. Geetha & Gita Wolf and My Henry by Judith Kerr, among many other books! About Drawing from the City, she says, "I hope you get a copy of this book so that you will likewise be touched by Teju’s life, and how through pencil and paper, she was able to touch the skies." Natalie of Biblio Links shares Etched in Clay: The Life of Dave, Enslaved Potter and Poet by Andrea Cheng. She says, "Dave’s story is powerful, and I’m in awe of Cheng’s ability to use a few hand-picked words to pack such an emotional punch. Lovely, sad, and–above all–hopeful." Lisa of Shelf-employed shares Aesop's Fables by Ann McGovern. She says, "Fables also invite imagination and embellishment. They're perfect for creating short plays, puppet shows, and flannelboard stories." Tara of A Teaching Life shares I.M. Pei: Architect of Time, Place, and Purpose by Jill Rubalcaba. She says, "The engagingly written text is just detailed enough to inform not overwhelm - tricky to do when one is writing about a topic that is rather complex." Jennifer of Jean Little Library shares Look Up! : Bird-Watching in Your Own Backyard by Annette LeBlanc Cate. She says, "This book does an awesome job of piquing kids' interest in the outdoors and making what might sound like a boring hobby (bird-watching) something kids might try out a time or two." Jeff at NC Teacher Stuff shares a book that fits right in with my review of the day: Orangutans by Meish Goldish. He says, "The text... lends itself to modeling for writing nonfiction. Main ideas and supporting details abound." Tricia of Bookish Ways in Math and Science shares The Boy Who Loved Math: The Improbable Life of Paul Erdos by Deborah Heiligman. She says, "I think all kids would enjoy this story, but if I were still teaching young kids today, I'd slip it [to] that child who felt he/she didn't fit in." Anastasia of Anastasia Suen's Booktalking also shares Look Up! : Bird-Watching in Your Own Backyard by Annette LeBlanc Cate. She says, "You don’t have to own binoculars and know a bunch of fancy Latin names to watch birds! No matter where you live, they’re in your neighborhood — just look up." Brenda of prose and kahn is featuring two biographies about boy geniuses: Albert Einstein and Paul Erdos. Of On a Beam of Light she says, "This lovely book surely deserves space on the biography shelf next to Kathleen Krull's excellent biography and the photo-biography Genius, by Marfe Ferguson Delano, which every great middle school library collection ought to have." Sue of Sally's Bookshelf shares Nature Recycles, How About You? by Michelle Lord. She says, "This book looks at recycling from sea urchins to bandicoots... and explores how animals in different habitats recycle materials for building homes to getting food." Roberta of Wrapped in Foil shares As Fast as Words Could Fly by Pamela M. Tuck. She says, "Can you imagine being the first African American teenager entering a classroom that had previously been for whites only? ... Mason Steele manages to find success in this challenging environment using his determination and award-winning skill at typing." Margo of The Fourth Musketeer shares Children of the Tipi: Life in the Buffalo Days, edited by Michael Oren Fitzgerald. She says, "Because there is no narrative from the editor as part of the text, the quotations and photographs together evoke a nostalgic view of the American Indian experience on the Plains." Jenni of Biblio File shares Little White Duck: A Childhood in China by Na Liu. She says, "This will be enlightening to American readers, as Na Liu's life isn't easy compared to modern American standards..."
Jeanne of True Tales & A Cherry On Top shares Something to Prove: The Great Satchel Paige Vs. Rookie Joe DiMaggio by Robert Skead. She says, "I thought this story of two amazing baseball players' parallel experiences provides a powerful comparison of how they received different treatment based on their race." Pam of MotherReader shares National Geographic Kids's Just Joking series. She says, "...[W]ith quality construction, engaging design, great photography, AND jokes, these books would make a fantastic addition to any library - public, classroom, or personal." Reshama of Stacking Books shares 13 Art Illusions Children Should Know by Silke Vry. She says, " In “13 Art Illusions Children should know”, art historian and archaeologist, Silke Vry has collected art work that cheats the eye and bewilders the mind!" Keep 'em coming! I'll update throughout the day!